Today I discovered new improvement of Google search result from Google.com, It highlights each listing with soft-blue color when you do mouse-over. The highlight will appear only when you are using mouse. If you use keyboard, it still look the same as usual. You may also notice in this screenshot, Google also displays the "Zoom" icon, this icon will use as Full Preview of the listing, it will be partially launching and testing for some particular markets at this moment..
Google keep testing on new user interface, introduced this year more than 150 User Interface changes. User feedback and interactive from users will be used as ranking signal in the future. Google's patent of "System and Method for Modulating Search Relevancy Using Pointer Activity Monitoring", was filed on February 16 2005, as Google currently used click-through rates (CTR) as ranking signal. The new patent takes the idea a step further, looking to reorder search results by monitoring when users show interest in web content without actually clicking on it. 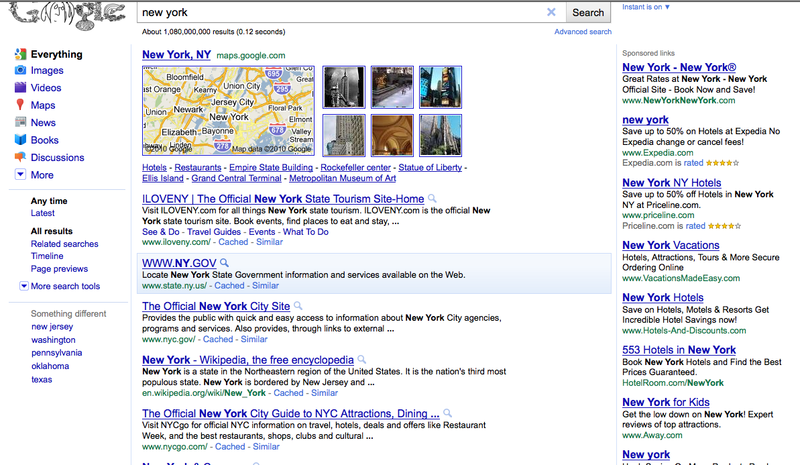 On October 19, 2010, I have found another search result differently from usual search result. It shows only 4 listings. Let check it out.